Sitting in a hotel room in Kingston last Tuesday night after two pretty tough days with Sussex seconds, I couldn’t have imagined the turn of events that would lead to me finishing the week having scored a maiden first-class century and been part of a brilliant win against Durham in the County Championship – writes Sussex CCC’s Tom Haines. I was halfway through watching Love Island with my room-mates George Garton and Academy player Tom Clark, when Dizzy’s number flashed up on my mobile. Chris Jordan had been called up to the England Lions and I’d be playing at Arundel the next day. Being perfectly honest, a first-team appearance wasn’t on my radar. I was absolutely buzzing about playing, though, and then I suddenly realised all my kit was locked in the pavilion at New Malden where we’d been playing a second-team match against Surrey. I was straight on the phone to Yards [Mike Yardy, Sussex’s second team coach] and we arranged to drive to the ground at 7.30am the next morning to get my stuff. Then there was the small matter of getting from there to Arundel. Time to ask for another favour, this time from my mum, who wearily agreed (it was 10.30pm by now!) 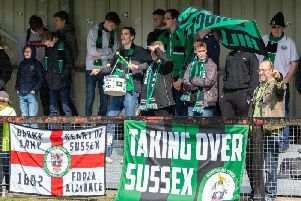 to drive from home in Horsham to meet me in south west London and then take me to meet up with the first team in Sussex. On the way down, I took the opportunity to quickly watch the videos of the Durham bowlers that our analysts had put together on my phone. When we pulled up at Arundel at half nine, I was told I’d be batting at number three, and with overcast conditions I had a suspicion Durham would be bowling first. So, it was straight into the nets for a hit. To be honest, the whirlwind build-up helped me. I didn’t have time to really think about what was coming and so I felt pretty calm. There were definitely a few nerves when I went out to bat in the fourth over, but nothing like when I made my debut as a schoolboy two seasons ago. My innings itself got off to a flyer, as I hit a couple of boundaries and Salty and I picked up plenty of quick singles. I don’t remember a huge amount of the detail as the adrenaline was running pretty high, but before I knew it I was on 25 and then at lunch we were both on 60-odd. We knew then we’d done our main job of seeing off the new ball and giving the side a foundation, so then it was a case of capitalising. Salty raced ahead to get to his first first-class hundred, which was a special moment in itself. But to follow suit soon after was like nothing I’ve experienced before. I didn’t have a celebration planned, so the roar I let our when I brought up three figures was purely instinctive. I heard the reaction from the boys watching from the bank, the adrenaline spike once again and I just let rip! Without doubt, the best moment I’ve had on a cricket pitch. Maybe I’m being greedy, but my only disappointment from the game was not adding a first wicket to my first hundred. I had a pretty good shout in my first over for lbw against New Zealand international Tom Latham, but it was given not out. Tom said it felt out! Still, I guess I’ll have to be content with the century and an innings victory for the team. Looking ahead, I’m not taking anything for granted. It’s back to the twos to work on my T20 skills over the next few weeks and then we will see whether I get picked for the two Championship matches in the middle of July. One thing is for sure, my experience at Arundel has made me want to do it again and again, just maybe with a bit more of a relaxed build-up in the future.